When most couples take their first steps in their new married life, they usually move in together (if they weren’t already living together before) and start dreaming about all the things they can do as husband and wife, such as starting a family or planning holidays or home improvements. Unfortunately, Christelle and I are not like most couples; our relationship has never been conventional – coming from different countries, meeting on the other side of the world, living in separate countries for two years, etc – and our married life would also start in an unusual way. Two days after we tied the knot, I flew back to England and left my new wife in Switzerland, 580 miles away. Some couples who have been married a long time might be thankful to put that kind of distance between them and their partner, but for newlyweds it is somewhat more difficult. As September ended, so did my time as a UK resident, as it was now time to drive over to Switzerland to really start our married life, something else that perhaps makes our relationship unique. Changing countries means you are effectively starting from scratch, especially as we couldn’t fit any furniture in the car for the drive over – we barely had enough space for our clothes. Fortunately, Christelle’s parents let us live with them in their apartment, so we didn’t have to rush to find somewhere to live, which was just as well considering I had no job and therefore no means to contribute towards the payment of the various bills that come with renting an apartment. We moved in with Nelly and Bernard, and so went from being newlyweds living in separate countries to being a married couple living with my parents-in-law. Like I said, our relationship is unique. Christelle had already found a job in Lausanne, so the idea was that I would concentrate on finding employment and adjusting to life in Switzerland whilst we live with Nelly and Bernard. A couple of months later, I still had not found a job, and I think it is fair to say that we were all looking forward to the day when Christelle and I would move into our own apartment. It’s not that Nelly and Bernard couldn’t wait to get rid of us – in fact, it was quite the opposite, as they continually told us we were welcome to stay with them for as long as we needed, showcasing the incredible generosity that they both have. Nevertheless, we decided it was time to start looking for somewhere to live, somewhere that would be our first real home together in Switzerland. In early December, we started to search for apartments to rent. The first place we looked at was a studio flat in the same apartment building as Nelly and Bernard. Having visited one or two studios in England when I was looking for a place for Christelle and me to live a couple of years ago, I had a rough idea of what to expect: a small living room / bedroom with a separate area for the kitchen and bathroom, and not really much else. However, what greeted us when we entered the front door was still quite a shock to me – the entire studio was about as big as the bedroom we had in Nelly and Bernard’s apartment. I tried to imagine how we would fit a bed, wardrobe, sofa and TV in the room, but simply could not picture it as the room was far too small. We would have likely had to put the TV in the kitchen area, or possibly put the wardrobe out on the balcony. I was surprised to learn that the previous tenants were a family of five – two adults and their three children – who all managed to cram into this one, tiny apartment. I presume they must have all slept in one, giant bunk bed and had only one change of clothes each. I was even more surprised when I found out how much rent we would be charged monthly for the privilege of living in such a small place. After discussing the pros and cons with Chris, of which the only pro was that we could see her parents often, we decided not to sign for the apartment, preferring instead to leave it for another family of midgets to take in the future. When I saw the price of the monthly rent for the tiny studio apartment, I began to worry that we could not afford anything larger, given than we would only have Chris’ salary to use for paying the bills. However, the determination to find our own place to live – somewhere that we could really call home – spurred us on, and we began to search for other apartments. In Switzerland they describe apartments and houses differently to how we would describe them in England. I was used to seeing adverts along the lines of “two bedroom house” that then list the different rooms that come with the property. In Switzerland, they instead refer to how many pièces there are in the apartment, along with the total amount of floor space (in square metres) of the property. For example, I found adverts for “1.5 pièce apartment, 30m²”, which would basically mean the apartment has a bedroom and living room/kitchen, spread over a floor space of 30m². This took a little bit of getting used to, but eventually I was able to search for apartments that seemed large enough for us. The first place we visited as part of our search was an apartment that took up the ground floor of a villa in Blonay, a village that is situated north of Montreux. It had a recently-refurbished kitchen and a bedroom that had a wardrobe built in to the wall, as well as a living room, a second bedroom, a garage and a separate utility room (for laundry). Each room was pretty small, particularly the second bedroom – the couple currently living there had a bunk bed in this room for their two children, and there was absolutely no space for anything else. It also had a small window that gave the kids a nice view of the garage. The front door opened into the living room (in front of where the TV was), and there was barely enough space to fit a two seat sofa in the room. The garage was a plus, but the driveway that we would have had to use was incredibly steep, and my little Peugeot 106 would have had a lot of difficulty climbing and descending the slope to the apartment in the winter time, when ice and snow would make it virtually impossible to get the car out onto the road. 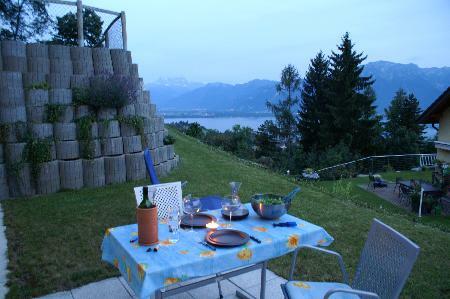 The main draw for the apartment here, however, was what we could see from the garden – a magnificent view of the French Alps across Lac Léman. I could imagine us sitting out in the garden, entertaining guests whilst gazing out over such a wondrous sight. Unfortunately, we had to be logical with our decision, and there were too many negative points that meant we simply could not put our names down for the apartment with the lovely view. The search would have to continue elsewhere. Our quest led us to a studio apartment in the centre of Lausanne. Being so centrally located, this place would be ideal for any transport connections, with bus and metro routes not far away, as well as being situated on a main road. Once we entered the apartment, however, we knew immediately that it wasn’t for us. The guy currently living there had one of those beds that are raised on stilts, so he could fit a desk and computer underneath with a sofa at one end. I had never seen this type of bed before, but apparently they are commonplace in cities where space is at a premium. Even so, it did not appeal to me. Even more unappealing was the kitchen – it was old, dirty, and above all, tiny. I could stand in the centre of the room and touch all four walls. We politely chatted to the current resident, who was a nice guy, but we both knew we couldn’t live in a place like this, especially as the sound of passing traffic could be heard easily even with the windows closed. So, another apartment was crossed off the list. We had arranged to visit an apartment in Chernex, close to Montreux, and made our way there for the viewing. I can only assume the current tenant is not particularly fussed about ensuring someone else takes over from her, given that she did not answer her mobile phone when tried to call her. Standing outside the apartment building, we attempted to find the number for the apartment we were supposed to see, as that was not written in the advertisement, but with the woman not answering her phone we were chasing a lost cause. Confused and disappointed, we had no choice but to drive away having not even set a foot inside the apartment. When we arrived at our next visit, an apartment in Puidoux, east of Lausanne, we didn’t even bother to ring the doorbell. The apartment was situated above, and next to, some sort of construction company, who had trucks and vans parked just metres from the building. Add to that the lovely view of electricity pylons and a main road, and you can begin to understand our immediate rejection of this apartment as a potential future home. We wanted to find our own place soon, but we were not about to stoop this low. Having visited a few apartments and not found ourselves drawn to rent any of them, we were beginning to wonder if we would ever find the right place for us to live. The problem was that the better apartments are naturally more expensive, and we were restricted by the amount we could afford to pay using Chris’ salary alone. We could not say for sure when I would find a job, so we had to base our budget entirely on what Chris brought to the table. Keeping our budget in mind, we continued our search and visited a little apartment in Lausanne. In what was a very old building, this apartment certainly didn’t look out of place – it clearly had not been decorated in many years and had an oven that must have been older than me. It consisted of two main rooms, one of which was the living room and the other the bedroom. In terms of size, these two rooms were not too small, but simply looked ancient, much like the chap who showed us around. The rent amount fitted at the top end of our budget, but neither of us felt particularly good in the apartment, and so we opted to not put our names down for it. Undeterred by the previous apartment, we kept looking. The next place we went to was a “sous-loc”, or sub-let, apartment in Cossonay (north-west of Lausanne) that would be available fully-furnished for a period of six months. When we entered the apartment, I fell in love with it immediately. It had been superbly well-maintained and decorated by someone who obviously has taste. The living room and kitchen were open plan with enough space for a large dining table in between, and there were plenty of green plants around that gave the apartment a nice feeling of homeliness. There was a huge wall cupboard in the hallway for storage, a large bedroom, and a big terrace area complete with a gas BBQ. I could easily see us living there, and began to imagine myself preparing meals in the spacious, new kitchen, or relaxing on the comfortable sofa watching the large, LCD TV. We chatted with the tenant from whom we would be sub-letting the apartment, and it turns out that he would be travelling for six months, returning in June. That meant we could rent the apartment plus all the furniture for the first half of 2010, and would then have to move out and give him back the keys. When we thought about this afterwards, we decided that this could potentially cause a problem, as it would mean we would have to go through another search for an apartment well in advance of June. What would happen if we couldn’t find anything? Would we have to go back to living with Nelly and Bernard? We still had one more place to visit the next day, so told the guy that we would let him know if we were still interested by the end of the week. Chris’ aunt, Babette, had told us that she knew of an apartment in Lausanne that had not yet been advertised for rent (the current tenant had not given her notice to the agency yet), so we went to visit it after seeing the other apartment in Cossonay. I have to say, I was pleasantly surprised by this place, as it was a 3 pièce – that meant it had separate living room, bedroom and kitchen, and it also had a reception area (that we imagined using as a small dining room) and a balcony, although the balcony was small and overlooked the main road so I didn’t think we would use it often. The kitchen seemed fairly large, certainly in comparison with others we had seen, and even had a huge wall cupboard for storage (ideal for Chris’ mountains of Tupperware). I still had images of the beautiful Cossonay apartment running through my mind, and could see that this apartment was more dated than the one we saw the day before. The walls and the ceilings needed new coats of paint, and the oven in the kitchen would need to be replaced. That night Chris and I discussed our thoughts on the two apartments. The plus side of the Lausanne apartment was that it would be ours for as long as we wanted it, whereas we would only have the Cossonay apartment for six months. However, Cossonay was fully furnished meaning we would not have to buy any furniture for our stay there, unlike the other apartment that would be practically empty when we moved in, meaning lots of trips to IKEA. After evaluating which option made more sense to us, we decided to go for the apartment in Lausanne, so Chris called the travelling Cossonay man and told him we had found somewhere else, so would not be watering his plants for the next six months. Another difference between England and Switzerland when it comes to renting houses or apartments is the level of difficulty in actually getting to the point where you have the keys to the property. In England – in my experience – you simply need to tell the estate agent that you are interested, give them your details so they run a credit check, and then sign the contract. In Switzerland, it isn’t quite as simple as that. If you are interested in an apartment, you let the estate agent know of your interest, and then you wait for more news. You might be waiting a very long time, or not actually hear anything back at all, as the estate agents can pick and choose who they want to give the apartment to. The problem is that there is such a demand for apartments in Switzerland, particularly in Lausanne, that there are a number of candidates who apply for each available property, and so the estate agents are not overly pressed to act quickly or, necessarily, fairly. To stand a better chance of successfully getting your name on the rental agreement for an apartment, you need to know someone who works in the estate agency (or know someone who knows someone, etc). For the apartment we wanted to rent in Lausanne, we had a slight advantage over other potential tenants – the apartment was not yet available as the current tenant had not given her notice to the estate agents. This meant we would be the first to apply for it, and hopefully therefore have a good chance to be successful with our application. Unfortunately, the estate agent would not let us sign up for the apartment until it was officially on the market, and, with us being in England for Christmas the following week, that meant we would have to wait until the New Year to apply. The danger with waiting was that other people could sign up for the apartment while we were away, meaning we would not be the first on the list. We tried not to think about the possibility of missing out on the apartment over Christmas, and instead enjoyed the time we spent with my family in England (read the "A Very Reed-Peck Christmas" blog for more on our festive fun and games). Read "Finding Somewhere to Live - Part II" to find out what happened next!